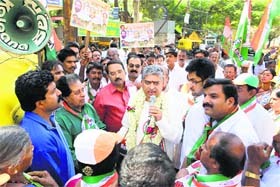 Nandan Nilekani is getting a feel of what it takes to be in politics and is seemingly enjoying it. The one-time Czar of India’s software business and former chairman of the mammoth effort to issue Aadhaar, or unique identity numbers, for every Indian, Nilekani is contesting the South Bangalore Lok Sabha seat – his first venture into the minefield of politics. Discarding his business suits and air-conditioned boardroom brainstorming sessions, Nandan, wearing a simple white bush-shirt and a tri-colour cotton scarf, has plunged into the sweaty, feely world of politics, rubbing shoulders with plebeians and doing, as he says with a smile, “whatever politicians do for a living”. Nandan decided to plunge into the heat, dust and vitriol of politics because he believes that the country needs massive change as it now has half a billion young people who have a “volcano of aspirations”. As a technocrat, while he could introduce some reform, Nandan feels that the only way to bring about “the change that India needs at the speed India needs” is to change the political process. “We need political decisions to bring the massive change, otherwise we would have a violent backlash,” he explains. The 1.9 million-strong constituency that Nandan is contesting in is an extraordinarily diverse mix of orthodox Bengalurians, young professionals, traders, middle-class householders and slum dwellers. There is also a strong minority component. To balance the differing aspirations, Nandan has adopted a mix of old-style politics where he scours the constituency meeting people, going on padayatras and addressing rallies with new-fangled campaign techniques which he calls, “high-tech and high-touch”. So within hours of his meeting groups or addressing rallies, these are out on social media, whether Twitter, Facebook or Youtube. Meanwhile, his core team of professionals has used software analytics to dissect the constituency to determine voting patterns, the swing votes and also address individual concerns. Personalised letters have been sent to voters apart from holding one-on-one meetings with interest groups. Yet the UPA-II’s performance has not really shone and Nandan is conscious of it. So he converts the battle for the constituency into one for deciding who is the best person to champion the needs and aspirations of the people. Nandan then reels out his pluses, “Everyone knows I have not come in to make money, that I ran Infosys successfully apart from the unique identification number scheme, and for Bengaluru I had also worked to improve its infrastructure. I am a local boy who was born in a local hospital and grew up in the streets here – I have a track record and am seen as someone who is clean.” A slogan he has posted on his website reads, “Politics is making promises that we can deliver.” For a start, he has promised to set up a 24x7 helpline to instantly attend to peoples’ problems. Since corruption has become a major issue in this election what does he think needs to be done? Nandan believes that despite the adverse publicity about Aadhaar it will result in a profound transformation and help in stopping micro-corruption. But to stop major corruption Nandan cites a formula propounded by Robert Klitgaard, a US based professor, which says that corruption equals monopoly plus discretion minus accountability, or C=m+d-a. To halt corruption Nandan states that one needs to reduce monopoly and discretionary decisions and improve accountability and this has to be done systematically. Though he claims that he has an edge, Nandan faces a tough battle. The Congress may be ruling Karnataka having defeated the BJP in the elections held last year, but the state is well known for voting for a different party at the Centre if it finds that it would help nationally. India does need politicians of Nandan’s calibre in the Lok Sabha and he deserves to be given that chance.